The Local & Family History Center of the St. Joseph County Public Library in South Bend (304 S. Main Street, South Bend, IN 46601) will hold a genealogy roundtable on Thursday, December 4 at noon. Bring a bag lunch, your questions and have fun - beginners and experienced researchers are welcome. Call (574) 282-4621 for more information. The Indiana Genealogical Society has added the December 2014 issue of IGS Newsletter, the society's bi-monthly newsletter for IGS members, to the Members Only area. IGS members should login to the IGS Records section to get their copy. This issue has an update on a project to preserve Lutheran Church records in South Bend. It also has genealogy news items from around the state. The Indiana Genealogical Society now has 1,414 databases in the Members Only area. Each of Indiana's 92 counties has at least 5 databases. The Indiana Genealogical Society now has 1,413 databases in the Members Only area. Each of Indiana's 92 counties has at least 5 databases. The Indiana Genealogical Society now has 1,412 databases in the Members Only area. Each of Indiana's 92 counties has at least 5 databases. The Hamilton East Public Library in Noblesville will hold a computer workshop on how to use free websites for genealogy research on Wednesday, December 17 from 9:30 am to noon in the library's computer training lab. In this "hands-on" workshop, you will learn how to use some free websites for genealogy, including Cyndi's List, FamilySearch, Find A Grve, Rootsweb, USGenWeb Project and Google. Bring information about your ancestors - you will have time to use these sites to do your own research. This workshop is free but registration is required. Register through the library's calendar of events on their website (www.hepl.lib.in.us) or contact the library's Indiana Room - phone (317) 770-3206. 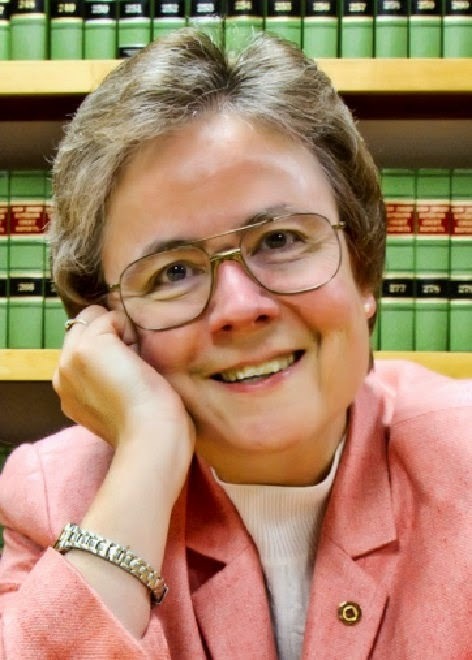 The Southern Indiana Genealogical Society will hold a free workshop on computer genealogy on Thursday, December 4 at 7 pm in the Strassweg Auditorium of the New Albany-Floyd County Public Library. 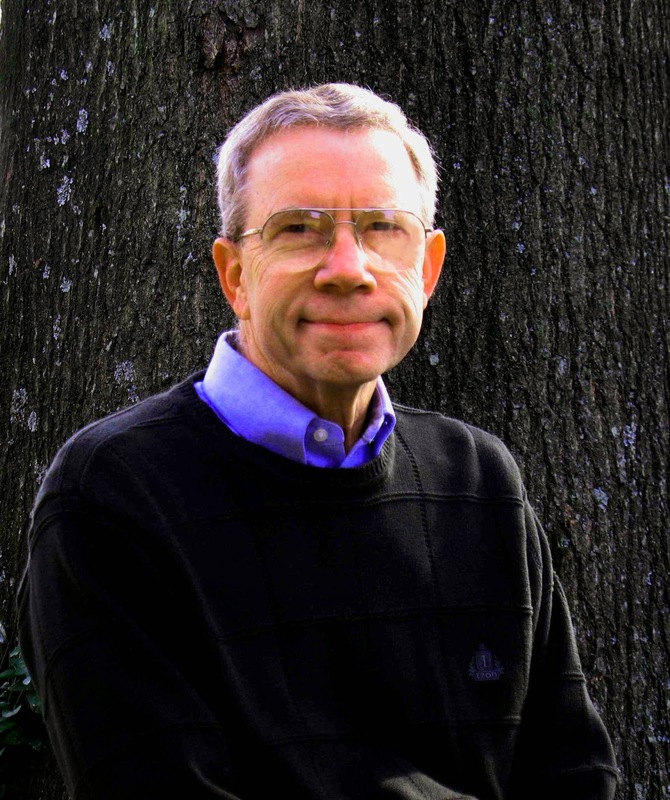 Genealogist Phil Hysell (pictured) will share tips, tricks, and techniques on how to make your genealogy come alive, be more efficient and more enjoyable by using your computer. He will illustrate the effective use of family tree databases, photo restoration, finding “lost” family cemeteries, writing your family story, and the creative use of old photos and 8 mm movies. Mr. Hysell is a member and past president of the Louisville Genealogical Society and editor of the Hisle-Hysell Genealogy Newsletter. For more information, please visit http://www.rootsweb.ancestry.com/~insigs/nextmeet.htm. DID HEZEKIAH STOUT DENHAM, b. 1802, TN; d. 1886, IA, HAVE A DAUGHTER NAMED ANNA OR HANNAH, BORN 1825--1828, IN INDIANA, HARRISON COUNTY? Help appreciated. Thanks. 7182 DARLING ST. S. E.
I'd like the obit for Kenneth L Felts, d 8-1-1982 Indiana. I don't know where. Thank you for your help. Find My Past, which is the new home of the Periodical Source Index (PERSI), is offering a 15% discount to members of the Indiana Genealogical Society. The discount can only be applied towards their World annual subscription, which includes records for the United States, Canada, United Kingdom, Ireland and Australia. Click here to see a list of all the databases that are available with a Find My Past World subscription. To redeem this offer, IGS members should login to the IGS Members-Only area for instructions and the special offer code. 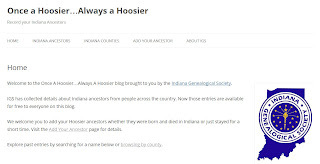 The Indiana Genealogical Society has launched the Once A Hoosier...Always A Hoosier blog to compile information on ancestors who lived in Indiana for any part of their lives or were buried in Indiana. Several thousand entries have already been included, and they can be searched by surname or by county. Want to contribute your information? There's an easy submission form - just click on the "Add Your Ancestor" tab. LEU information will be updated for the conference's other sessions when they are approved by the Indiana State Library. The local host of the conference will be the Wabash Valley Genealogy Society. Register for the conference online, or download our printable registration form (PDF format). Indiana Genealogical Society members will receive a $10 discount on conference registration. The Hamilton East Public Library in Noblesville will hold a genealogy roundtable on Tuesday, December 9 from 2:15 to 3:15 pm in the library's genealogy classroom. The group will share their family's Christmas traditions, stories, memories and experiences. The Genealogy Center of the Allen County Public Library in Fort Wayne will hold a free class on the use of Google Maps on Wednesday, December 10 from 3 to 4 pm in the library's Meeting Room A. John Beatty and Dawne Slater-Putt will show you how you can use Google's map products, including Google Maps and Google Earth, to discover more of your ancestor's story. This class is part of the library's WinterTech series and is free to the public - register by calling (260) 421-1225 or e-mailing Genealogy@ACPL.Info. The Indiana Genealogical Society now has 1,411 databases in the Members Only area. Each of Indiana's 92 counties has at least 5 databases. The Indiana Genealogical Society now has 1,410 databases in the Members Only area. Each of Indiana's 92 counties has at least 5 databases. The Indiana Genealogical Society now has 1,409 databases in the Members Only area. Each of Indiana's 92 counties has at least 5 databases. The Indiana Genealogical Society now has 1,407 databases in the Members Only area. Each of Indiana's 92 counties has at least 5 databases. The Allen County Genealogical Society of Indiana's Genealogy Technology Group will meet on Wednesday, November 19 at 7 pm in Meeting Room B of the Allen County Public Library in Fort Wayne. There will be an open discussion of anything related to the internet, computers, social media, genealogy software, etc. Bring your questions and problems - this meeting is free and open to the public. The Indiana Genealogical Society now has 1,403 databases in the Members Only area. Each of Indiana's 92 counties has at least 5 databases. 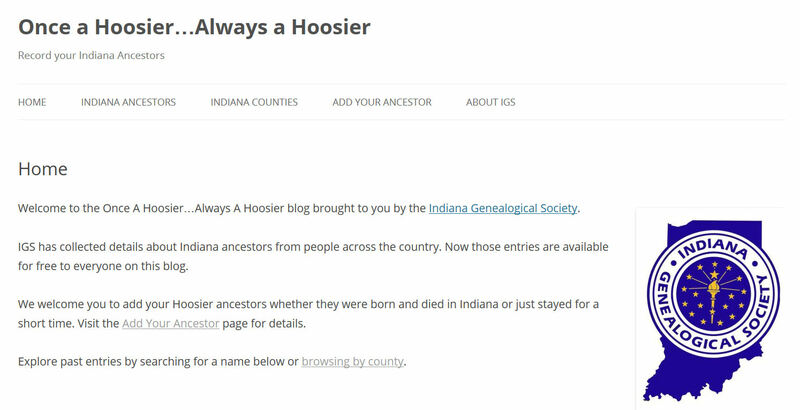 The Indiana Genealogical Society now has 1,400 databases in the Members Only area. Each of Indiana's 92 counties has at least 5 databases. The Indiana Genealogical Society now has 1,397 databases in the Members Only area. Each of Indiana's 92 counties has at least 5 databases. This is a free database - no membership is required to view it. It was contributed by Wayne Klusman. The Indiana Genealogical Society now has 1,396 databases in the Members Only area. Each of Indiana's 92 counties has at least 5 databases. The Allen County Genealogical Society of Indiana will meet on Wednesday, November 12 at 7 pm in Meeting Room A of the Allen County Public Library in Fort Wayne. Writer and editor Kelli Bergheimer will show you how to save time by learning how to organize your papers, photos, progress, and digital reports. The meeting is free and open to the public - at 6:30 pm there will be refreshments and social time. I am working on the Tropp Family genealogy. I have documentation that shows my Grandfather, Eugene Edward Tropp, was born in Metz, York Township, Steuben County, Indiana, ca 1880. I have no further information on the family. Would someone be able to assist and guide me as to where I might be able to verify this information? If there is a cost associated with this request, please advise me as soon as possible. Thank you in advance for your assistance. The Hamilton East Public Library in Noblesville will hold a computer workshop on how to use Heritage Quest Online on Saturday, December 6 from 9:30 am to 12:30 pm in the library's computer training lab. In this "hands-on" workshop, you will learn how to effectively search the databases in Heritage Quest Online. You will also have time to do your own research. Indiana librarians can receive LEU credits for attending. Seeking info on family lines descending from great-grand-uncle Jacob Warner Egelston of Dearborn County and other counties. He was a mason, carpenter, farmer, and state representative in 1838. Had two marriages. He was born in Steuben Co., NY, 1802. His father Samuel Egelston and mother Hannah Tripp moved family to Campbell Co. KY in 1815. She remarried a Clement. Jacob moved to IN in 1824. My great grandfather Charles Martin Egelston, born 1807, moved to Joliet Twp., Will Co., IL, by 1841 with wife Maxamilian Mary Race and children, then to Marshall Co, KS in 1857. Willing to share info. Genealogy group Twigs from the Tree of Life will meet on Tuesday, November 25 at 7 pm at Christ the King Lutheran Church in South Bend (17195 Cleveland Rd., South Bend, IN 46635). Instructor Nikki Barra (nichelle.barra@gmail.com ) will discuss genealogy educational opportunities including free online tutorials and lessons; genealogy classes, courses and lessons; national genealogy institutes and conferences; how to become a professional genealogist, and requirements for professional genealogy certification. The meeting is free and open to the public. The South Bend Area Genealogical Society will meet on Monday, November 24 at 7 pm at the Sunnyside Presbyterian Church in South Bend (115 S. Francis, South Bend, IN 46617). John Hundley of Sons of the American Revolution (SAR) will present a program on 2 of his Civil War ancestors, a colonel of an Illinois regiment and a commander of a Confederate regiment who fought each other at Vicksburg and Gettysburg. This program is free and open to the public - for more information, please contact Bill Minish (whminish@aol.com).